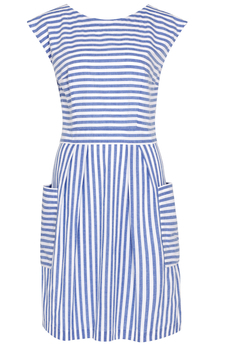 Zoe Sun Lounger Stripe Dress is a fresh easy-to-wear summer dress. A low V-back and button fastenings at the back add a playful feel to this summer staple. Has large patch pockets at the side and grown on sleeves. Is made from 100% cotton that feels luxuriously soft and adorned with woven chambray and white stripes. Is fully lined and is approx. 100cm in length. New Summer 2019 Collection. Composition: 100% Cotton. Lining: 100% Cotton.